When I arrived at our shop on September 11, 2001, others already at work immediately asked me if I had heard the news. I had listened to excited voices on NPR in the five minutes it takes me to drive from home to shop, but I had not yet been able to comprehend what was being reported. I still had little understanding how serious the situation was when I turned around and headed back home for my tiny portable TV. As I returned to the shop, the radio announced that a second plane had struck the second tower. Our world had entered an unknown era that changed our lives forever. Business went on. I suppose we experienced some of the recession, but it was not our focus. We make a practice of staying busy whether with customers or community. 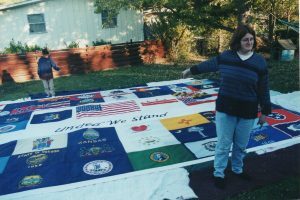 We were asked to construct what was called a Unity Flag – a 16’x24’ work of art with a flag of the United Stated in the center, a large flag-like cloth beneath it declaring United We Stand, and flags of all 50 states sewn around. Our flag, along with another made by someone else, were delivered to Ground Zero to wave in the wind. Pictures of flag on table and in back yard. When the Sandy Hook heartbreak occurred in December, 2012, Joyce Abernathy and her sister Michelle Crisler headed up a project to make colorful pillows with each child’s name on it. We donated pillow forms, boxed them up, and sent them off to Newtown. As time went on, we learned that our flag had been torn in that wind and that Joyce and Michelle’s pillows were likely still stored in a warehouse rather than delivered to the families we had hoped would receive them. We admit to being a little disappointed but not stopped. We believe in the spirit of giving as opportunity presents itself. The same goes for our customers – who almost always give back their verbal appreciation and sometimes write it out. Primarily, however, we work toward a fair exchange of meeting customers’ needs with our best ideas and products.